Ever since the mainstream adoption of the mobile smartphone, the word 'smart' is used broadly to define any device that has some form of on-board communication connectivity. Likewise, a Smart Home is designed to deliver a number of digital services inside and outside the home, through a range of networked devices. Juniper Research believes the entertainment segment to be the most viable in terms of consumer uptake, for the simple reason that these services are almost universally desired. 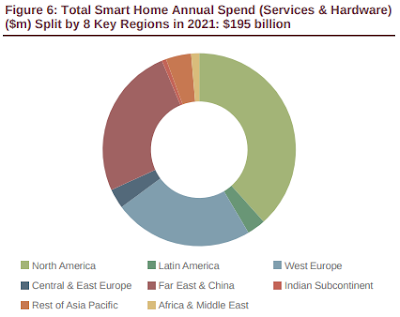 Revenues from smart home hardware and services will reach $83 billion this year, rising to $195 billion by 2021, according to the latest market study by Juniper Research. This revenue upside will be generated through entertainment, automation, healthcare and connected devices. The new research also found that home automation and smart appliances will be the two fastest growing segments over the next 5 years, driven by established manufacturers such as Samsung, Bosch and GE Appliances. Moreover, market leaders such as Alphabet, Amazon, Apple and Samsung will further solidify their position by building on current assets in their cloud services and incumbent device bases. Juniper believes Amazon's innovative approach, use of cloud services through 'Amazon Alexa', and its ability to capitalize on its eCommerce presence gives the company a leading position in this emerging marketplace. "The company has managed to maximize its value proposition for Alexa by partnering with a large range of complementary players in the market, while utilizing its own cloud platform to set Echo and Alexa apart from its competitors in terms of functionality," said Sam Barker, research analyst at Juniper Research. The research found that revenue share from the most mature segment, smart entertainment, will slow as emerging market segments such as smart appliances and home automation gain more traction. The share from connected services, such as Netflix and Amazon, are set to fall from 70 percent of the total market in 2017 to about 50 percent in 2021. Meanwhile, growing market segments such as Monitoring & Automation will be driven by disruptive entrants -- such as littleBits, Notion and iVee -- who will rival established players by taking novel approaches to product development.